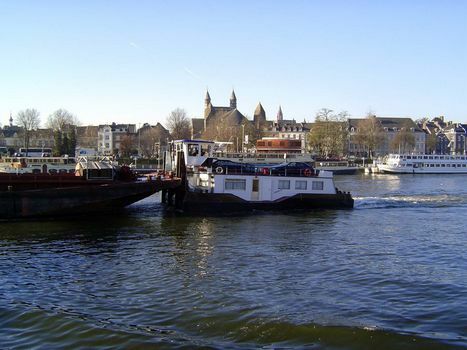 Maastricht began as the Roman town of Mosae Trajectum, the "Maas Crossing" on the road to Cologne. 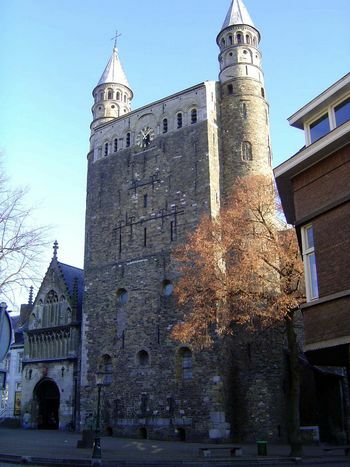 It became a bishopric in the time of St. Servatius (d. 384), a name still current in the city. 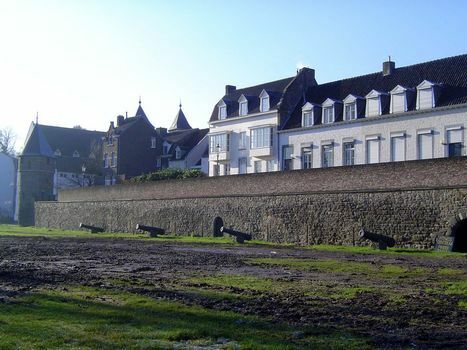 More than a thousand years later, in 1579, a Spanish army captured the city from the Dutch and butchered 8,000 townsfolk. 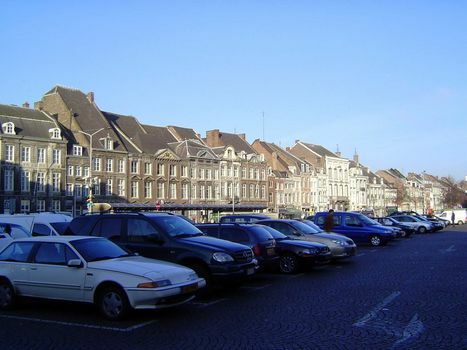 The city was subsequently captured at least three times by the French--in 1673, 1748, and 1794--but the Dutch held it against the Belgians in 1830. 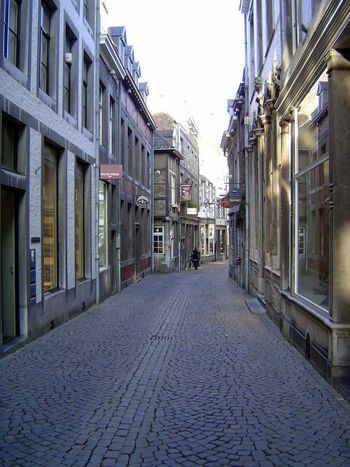 Maastricht then became a manufacturing center for pottery, glass, paper--and beer--and its population has risen in the last century from 35,000 to 122,000. 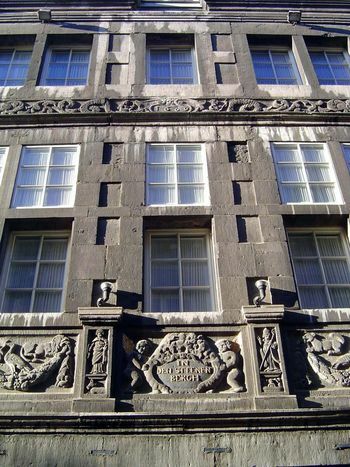 Since 1975, the city has housed the increasingly opulent European Fine Arts Fair, and recent investments in restoration as well as new construction make the city's long and bloody history seem very far away.. The St. Servaasbrug (the name is a reminder of St. Servatius) was built in the 1280s a couple of hundred yards downstream from the site of the Roman bridge. 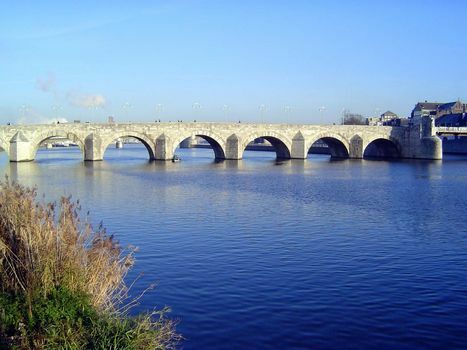 It was rebuilt in 1683, though arches on the far side have been replaced to allow barge passage. Visually, it's not much of an improvement. 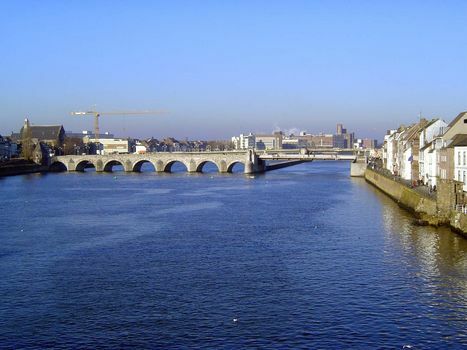 We're at the heart of the city, a couple of blocks from the left bank of the river. 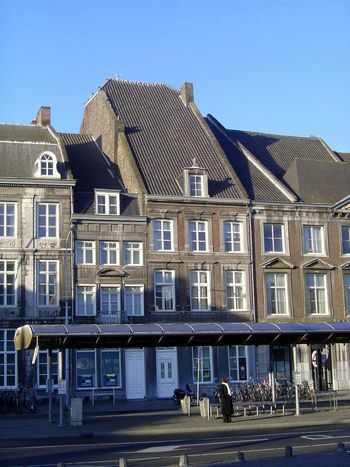 Specifically, we're looking down Grote Staat to Het Dinghuis, a former courthouse and later a museum of antiquities. 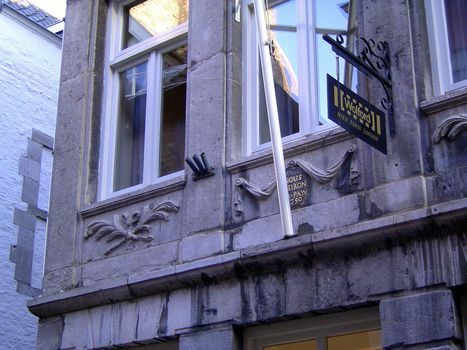 It now houses the Tourist Information Center. 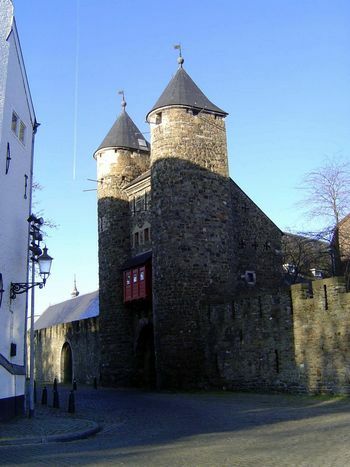 The half-timbered north wall is from the 15th century. 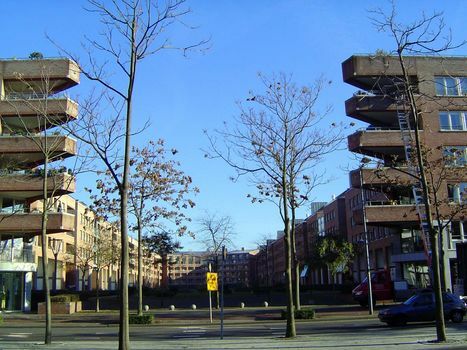 The view south from Het Dinghuis along Kleine Staat and the Stokstraat Quarter, expensively rejuvenated in the 1960s and 70s. 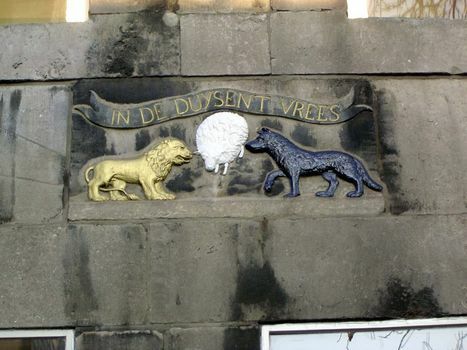 The so-called gable stone behind the flagpole reads "Nous desiron la paix, 1790." 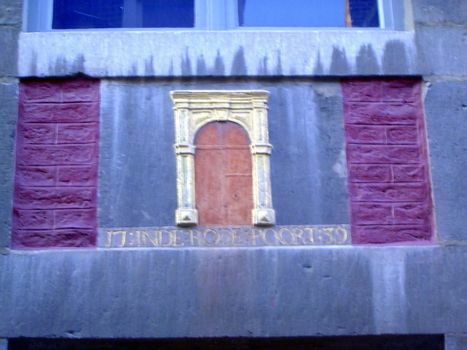 Here's that building with the "Red Door." In Den Steenen Bergh (1639) or "Stone Mountain." 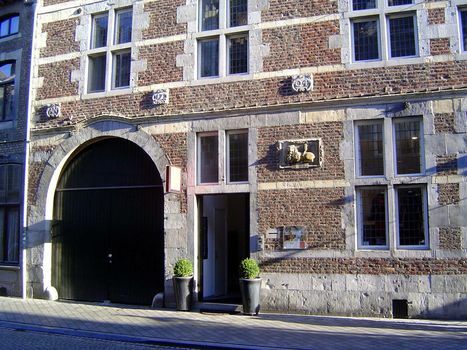 Small mystery: the name makes little sense, even to native Dutch speakers. 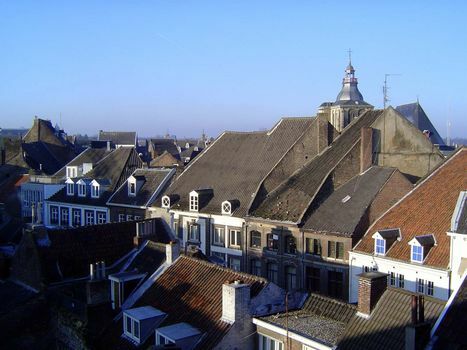 These "saddle" roofs are characteristic of the city and were intended to store siege supplies. Traffic management is a challenge. Here's part of the local solution. That's an elevator housing in green on the left. The fence wraps a driveway on the right. Under it all: a garage. The basilica towers keep watch from the distance. 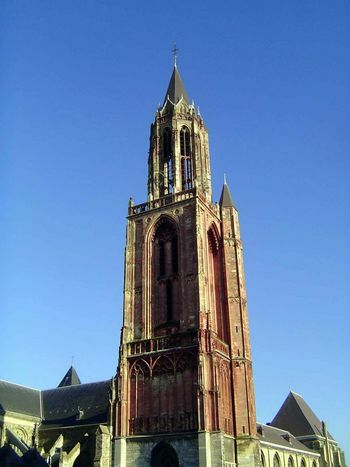 Onze Lieve Vrouwekerk, the Basilica of Notre Dame or Our Lady, was established about 1000 A.D. on Roman foundations. It's the oldest church in town, though, as you might guess from their color, the twin towers are reconstructions, from about 1900. Another view on a very chilly December morning. 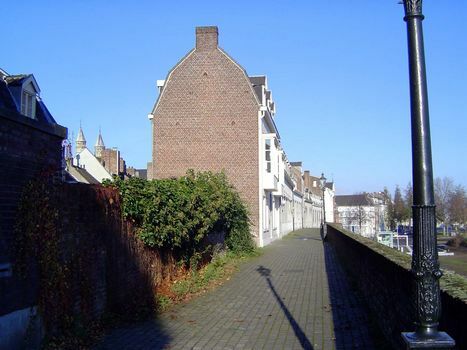 The Onze Lieve Vrouwewal, the portion of the city wall closest to the basilica; from about 1300. 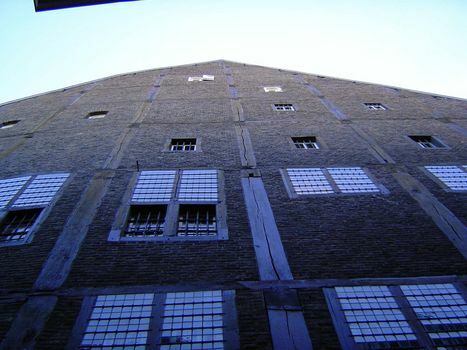 The same wall, seen from topside. Notice the bulky attic. 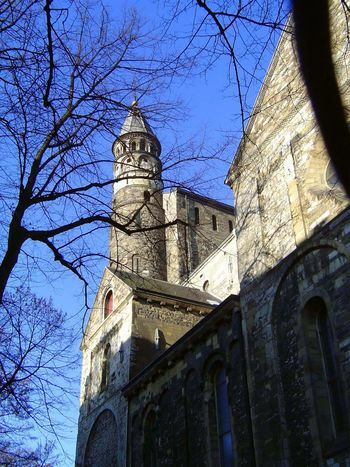 Jeker Tower, through the city wall. 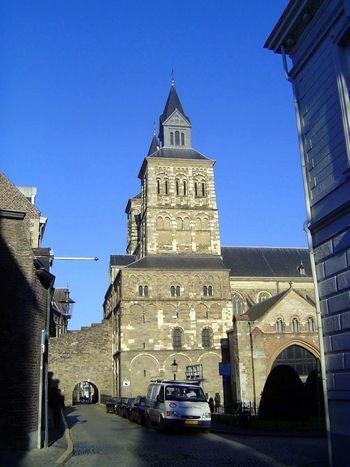 Another church, the cathedral church of St. Servatius. In 1881, his tomb was found in the eastern crypt. 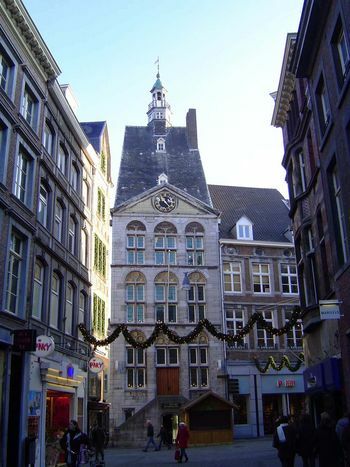 Next door is the Protestant church of St. John, built as the cathedral baptistery. 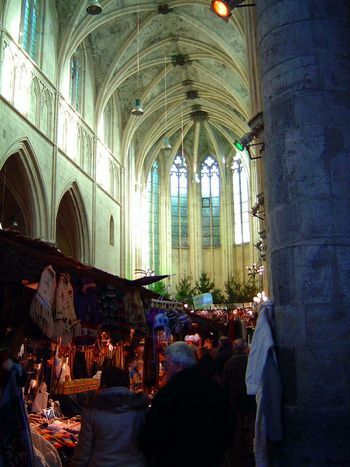 A Dominican church from 1294, now a market. It's been retired for at least a century. 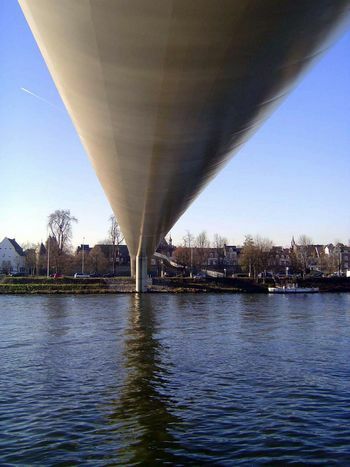 We're on the other side of the Maas now. 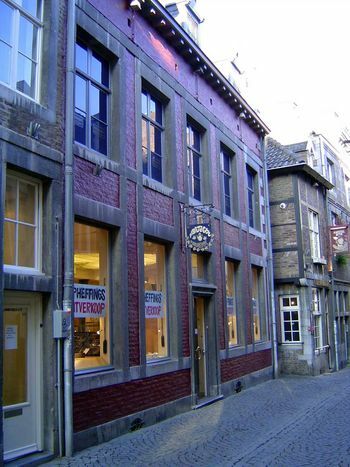 There's a neighborhood here, Wyck, which seems in keeping with historic Maastricht, but we're here for some modern town building. We've crossed the river on this. 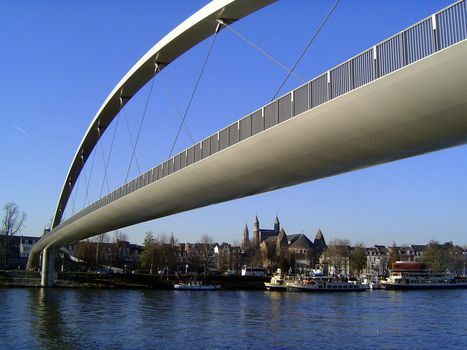 Another view of the Hoeg Brugk, the "high bridge," designed by Rene Greisch. 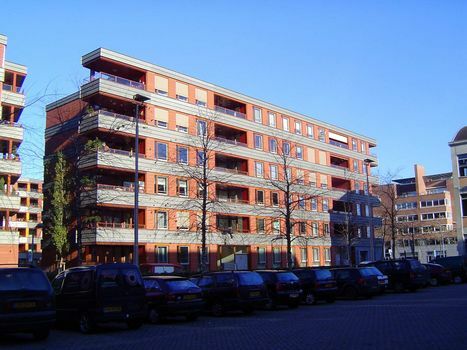 Near the abutment are the strikingly modern Meuse Apartments, with six units. 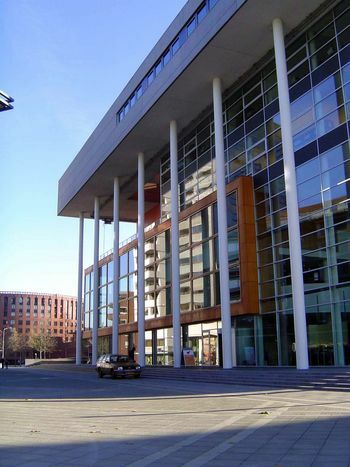 Upstream: the Maas Point Tower, or Maaspunttoren. 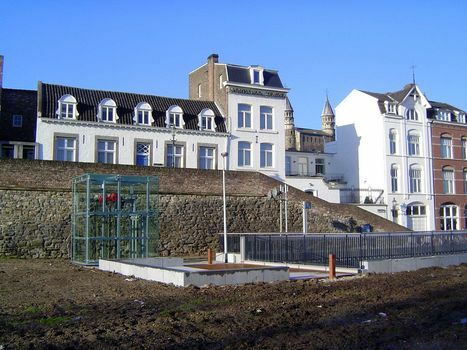 Behind the apartment building is the Centre Ceramique, a municipal hall, library, and archive designed by Jo Coenen, who masterplanned the whole neighborhood, which is known as Ceramique because it stands on the site of a former earthenware factory. 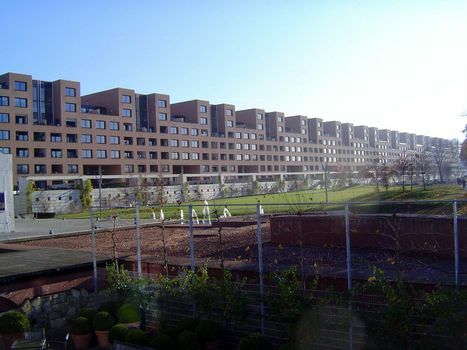 The Cortile, a massive apartment block of 310 units designed by Bruno Albert. Another apartment block, the Patio Sevilla, designed by Antonio Cortiz and Antonio Cruz. 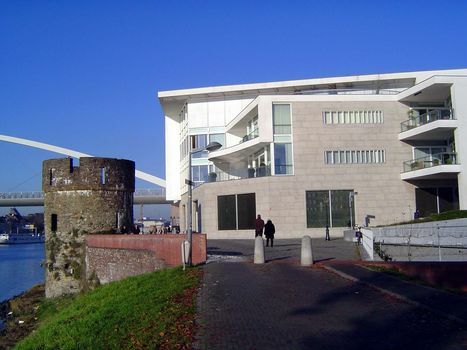 The scale of the development is suggested best by the Stoa, which runs along the riverside for almost 1,000 feet; the design of the building, with 131 apartments, was by Luigi Snozzi.